One of the first acts of a new corporation is to set up a corporate board of directors. The board of directors for a corporation is responsible for steering the corporation through the rough waters of its mission to the shareholders. A corporate board also has legal duties and other duties, spelled out in this article. The individuals who are selected to be on the board of directors of a corporation have overall responsibility for the activities of the corporation. A corporate board is not responsible for day-to-day decision-making; the daily decisions are made by the corporation's executives and managers. The corporate officers are the people who head departments, and these executives are responsible for running the business. Think of it this way: The board of directors operates like an airline pilot at the 30,000 feet level, overseeing everything, seeing the big picture, and changing course when necessary. The executives operate at the 1000 foot level, while the employees are on the ground. The board acts on behalf of the shareholders to make overall policy decisions and provide oversight. The board has a fiduciary duty with respect to the shareholders; that is, the board has financial and other responsibilities to keep the corporation running efficiently, so the shareholders don't lose money. A corporate board has great power and also a great responsibility. Specific duties of the board of directors and individual board members, committees, and officers are set by the corporate bylaws. The bylaws establish the specific duties of the board of directors and establish rules of procedure for the board. While this sounds just procedural, the operations of the board are key to the running of the corporation. For example, the board can vote on a move to a new location or a change in major products or services. As noted above, corporate board members have a fiduciary responsibility to care for the finances and legal requirements of the corporation. They must act in good faith and with a reasonable degree of care, and they must not have any conflicts of interest. That is, the interests of the company must take precedence over personal interests of individual board members. Board members are responsible for setting the mission of the company and assuring that all actions are related to and adhere to that mission. The board can change the mission, but only after careful deliberation. All large corporations have mission statements, and creating a mission statement should be one of the first things the board of a small business should tackle. 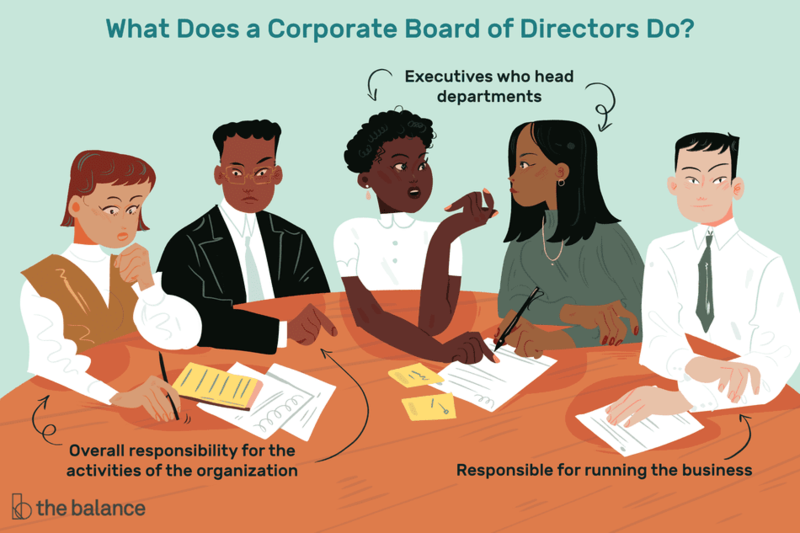 Corporate boards of directors do not participate in day-to-day decision-making; instead, they set overall policy, based on the corporate mission and vision, and they exercise an oversight function, reviewing the actions of corporate officers and executives. At the annual meeting of the corporation, the board announces the annual dividend, oversees the election of corporate board members, elects or appoints officers and key executives, and amends the bylaws, if necessary. What liability does a corporate board of directors members have in their board positions? Not as much as you might expect. Corporate board members have a good deal of latitude within the scope of their duties as corporate board members. Board members must be free to act in the interest of the shareholders to run the corporation in the best way they see fit and to take appropriate risks to help the company grow. Directors and officers may be sued individually for acts or errors they commit while serving the corporation. These individuals may be held personally liable for such acts. If a director of officer is found liable for a wrongful act, his or her personal assets may be used to pay damages to the plaintiff. What Products and Services are Subject to Sales Tax?